I love the taste of fresh homemade bread. It is so delicious and always hits the right spot for me. It is a great carb to add to any meal if you ask me. I wanted to create a good recipe for clean eating bread and this is what the recipe evolved into. When my husband was laid off for three months a while ago, we did everything we could think of to cut down on expenses around here. So we stopped buying spelt bread at $6+a loaf (which goes very fast in our family). I made a spelt flour bread recipe I have made in the past, but my children didn’t like it. Go figure. I thought it tasted great but my children were thrown off because when you use whole grain white spelt it’s neither white nor brown. They wanted white bread. Which is weird because they normally only eat whole wheat or spelt bread. Go figure. I’m also not really into regular bread that takes hours to rise. I definitely do not think that far ahead nor do I have all day to cook. So I came up with this spelt baguette recipe. The most important part – all four of my children devoured it! I even had some and loved it. It’s so quick and easy. I just start to make it when I start making dinner, I get my main dish cooking while it rises then throw this in the oven. It couldn’t be easier. Here are some tips: The amount of flour varies greatly depending on many things so don’t be afraid to keep adding flour until it doesn’t stick anymore but stop as soon as you get to that point. If your yeast doesn’t rise (get really nice and foamy), then the yeast is bad, get some fresh yeast. Don’t waste your time and flour making it into bread. Don’t be afraid to knead the dough for a while – you’ll get some good muscles and it will make it taste better. I really liked the combo of einkorn and spelt in this spelt baguette recipe. The spelt gave it a chewy texture and added a lot to the flavor. Baking these with a hot dish filled with ice cubes on the bottom rack of the oven gave them an artisan feel, with a crusty outside and a soft, chewy inside. This dough holds its shape very well when baked. Keep in mind that these flours will not rise in yeast bread like white flour will. It will rise, just not quite as much. I hope you enjoy the recipe and give it a try! What recipes would you like to see us come up with in the future? Comment below and we will see what we can do to make it happen! After you try this spelt baguette recipe come back and give me your feedback. I’d like to know if you like it as much as I do. 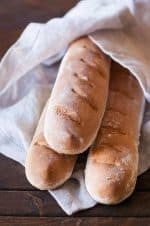 This Clean Eating baguette recipe is easy to make and it looks pretty to impress guests and my family with. Combine the einkorn flour, spelt, yeast, and salt in the bowl of a stand mixer fitted with a dough hook. With the mixer on low speed, add 1 C. of the water to the dry ingredients. Slowly add the remaining 1/4 c. of honey water, 1 tablespoon at a time, to the bowl until a dough forms. Dough should be moist, but not sticky. You may not need all of the water. Let the dough rest in the bowl for 10 minutes. Lightly dust your work surface with einkorn flour. Knead the dough for 10 minutes, until smooth and elastic. Coat your hands with flour, as needed. Divide the dough into 2-3 equal pieces(depending on if you want two larger or three smaller baguettes). If making 3 baguettes, roll each piece of dough into a 12″ long log. Line a baking sheet with parchment paper and dust with einkorn flour. Place the three dough logs evenly spaced lengthwise on the flour dusted parchment. Using a sharp knife, make 5-6 diagonal cuts across each baguette. Lift the parchment paper in between each baguette and crease to separate each one. Cover the dough with a cloth and let rise in a warm location for 1 1/2 hours, or until doubled in size. Preheat the oven to 500 degree. Place an oven proof, non-glass dish on the bottom rack of the oven. 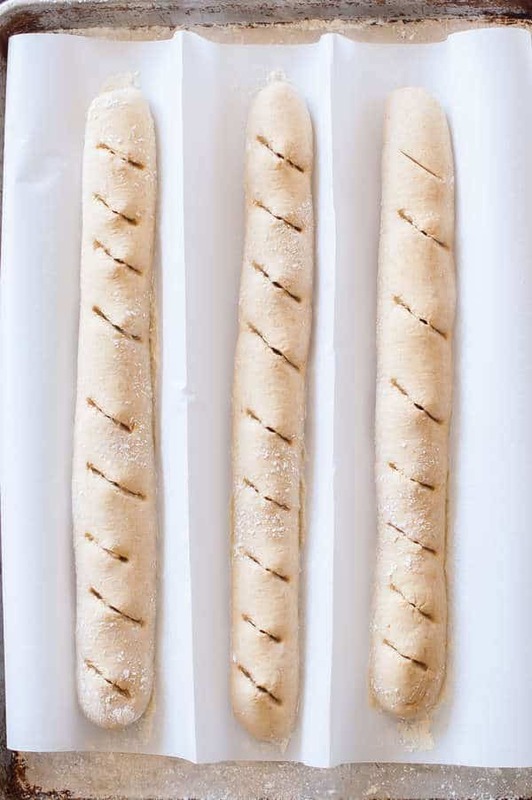 When the dough is ready, add about 10 ice cubes to the hot oven proof dish and immediately place the sheet of baguettes on the middle rack of the oven and shut the door. Turn the temperature down to 450 degrees. Bake for about 15 minutes, or until baguettes are golden brown. Eat the same day baked for best texture. I haven’t tried it. I’m terrible about freezing things, but I’m hoping maybe another reader has done this and can help you. Really good recipe, and subbing other flour worked fine for me! I used 3 cups spelt and one cup normal strong white flour as I didn’t have anything else and the results are delicious!!! Thanks for the nice comment. Hopefully it will help ours know what substitutions will work! I’ve never heard of Einkorn either! I can’t say, you can give it a try and see how it turns out. I would love to hear how it works for you. Wow this looks like such an amazing recipe!!!! Can you use something else than einkorn flour? Because I don’t have it here in Belgium ? can Ik be substituted for whole wheat flour?? Thank you. Love to try it out !! You can give it a try to sub the flours, I don’t know for sure but the only way to know is try. 🙂 Let us know how that works out for you! Thank you so much for adding the links to help find where to purchase the ingredients. I’d love to try this bread but might have abandoned the task since I hadn’t heard of Einkorn flour before and wouldn’t have known where to find it. I love bread I wish I was as good at making it as I am eating it. This is such an interesting bread recipe. I will have to give it a try. i have never heard of Einkorn flour. I have used spelt. I’m inspired to investigate. this is awesome!!! Thanks so much for sharing – pinned it to try later! I have never used spelt to bake with but these baquettes sound wonderful!! I like there are only a few ingredients and the tip about the ice cubes is interesting for the artisan texture! Oh my goodness, I love bread! Thank you for sharing! I have been saving a bunch of recipes for making all kinds of breads. This one is the one that is going to get me started on trying them out. Thanks for the recipe! Pinned! I have been looking for a baguette recipe and this one looks great! Pinned and stumbled! I can’t wait to try this recipe. 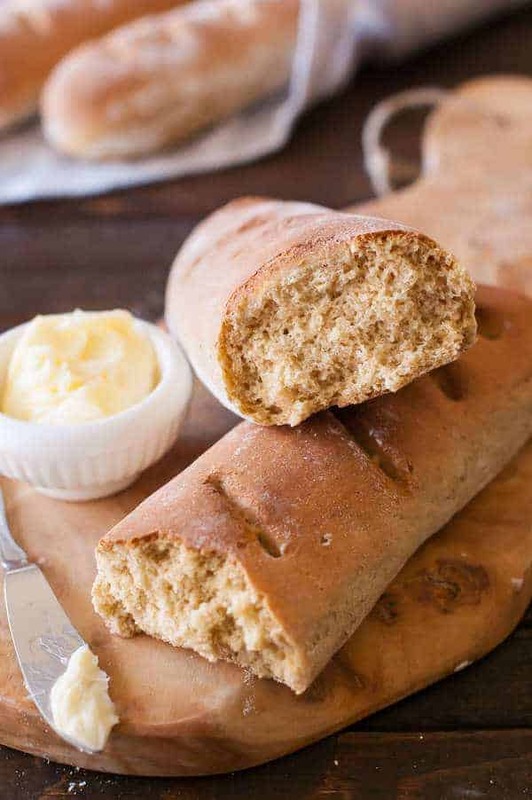 My son is crazy about this bread and it will tickle him if I can make the homemade version. Thank you so much.